Having never been woken before by the sound of wild turkeys, it took me a moment to find my bearings. Through my groggy haze, I realized that the woods around our campsite had been temporarily invaded by what sounded like a large group of these usually evasive birds. What an incredible way to be woken up. The evening had already been a fun one, with a later than usual dinner at our campsite (no. 505), followed by cocktails and campfire at my brother Ryan’s campsite (no. 506), our neighbor for the weekend. 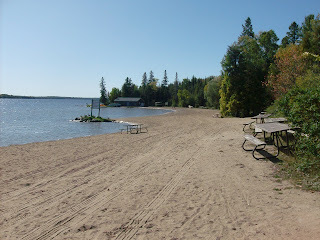 One of the joys of camping in late September, at least at Balsam Lake Provincial Park, is the lack of other campers. With only a handful of other diehard campers in the park, the quietness helped make us feel like we had the park and beach to ourselves. In fact, there were only two of five campgrounds open in the park. I found this park to be unique in that it featured some of the most amazing, as well as some of the least desirable, sites of any park I have visited. 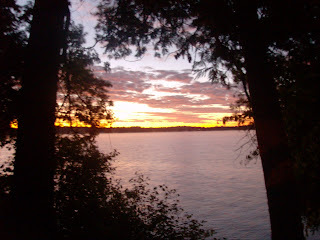 The key to site selection here is choosing one of the sites that border Balsam Lake. 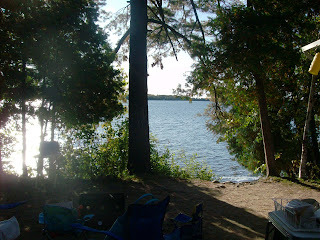 In the Lakeshore campground sites 502, 503, 505, 506, 508, 510, 512 and 513 are all waterfront, have hydro and are large and private. Sites 504, 507, 509 and 511 are across the park road from the water and provide a water view but without the luxury of being able to cast a line right from your campsite. I found some areas of the Lakeshore campground park to be very open with small sites and minimal privacy. These would mainly be sites 40 – 123. Unless you have a large trailer and require a pull-through site, you will likely find these to be more open than you would expect for a provincial park. The remaining campgrounds, particularly The Hawthorne Valley and Mapleview sites are beautiful and wooded, although many of them are not equipped with hydro. An interesting fact about Balsam Lake is that it is situated in the chain of rivers, lakes and canals that make up the Trent-Severn Waterway and is 256 metres above sea level. This makes it the highest point on earth to which a boat can be navigated from sea level. With a beautiful beach, boat rentals, hiking trails, a variety of programs to participate in and of course, the sounds of wild turkeys in the night, Balsam Lake is a great summer destination. Hey, I’m on the balsam site now and when I look up sites the 500’s don’t show water?